The places mentioned are shown on cycle route signs, with the exception of the ones in brackets that indicate which of many possible routes is used. This was drawn partly as a clock-face layout. I started by putting National Route 1 towards Sandringham which is sort-of NNE at roughly one o'clock, then it extends roughly southwest, so I continued it back through the centre. Then the Hulton/Gayton Road route heads roughly east, so is three o'clock, so is now numbered 3, while the A10 cycleway becomes 6 and the West Lynn and Sutton Bridge route becomes 9 - the last two also extend back through the centre a little. After those four clock points, the route towards Knight's Hill sort-of fits between 1 and 3, so becomes 2 (even though it extends back west to the docks), while 4 (the Sand Line Path aka Swaffham Belt Path) and 5 (to Swaffham) are more obvious fits between 3 and 6. Then we get the difficult decisions. At the moment, our shortest half-decent Fakenham route (via Grimston and Massingham) definitely doesn't connect well to the Hospital (the awful Bawsey Bumps) or the end of route 2 at Langley Road, but I suspect it's more likely to connect to Langley Road somehow (maybe some new link between Sandy Lane and Lodge Lane?) 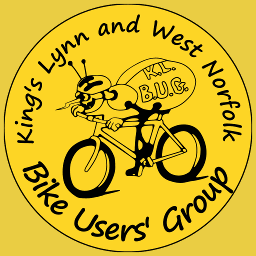 before it does the Lynn and Fakenham Greenway (which could be an eastwards extension of routes 3, 4, 5 or 7, depending on which route the councils build), so it's been extended west to Castle Rising Lodge Lane and the Fakenham route becomes part of route 2. 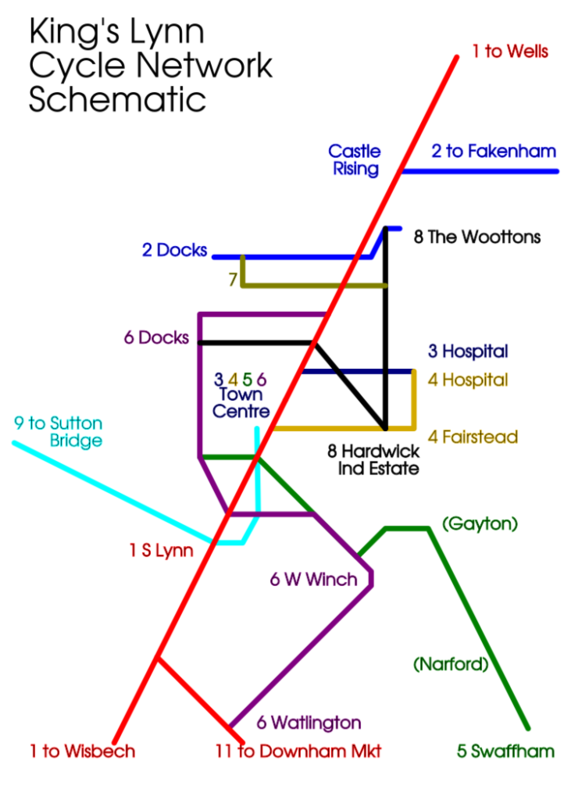 The remaining routes of Reffley to Fairstead to Gaywood to North End (8, because it makes that shape crossing other routes) and North Lynn to Marsh Lane to QE Ave (7 because it's got one corner on the map - more in reality) have been given the unused single-digit numbers, while National 11 forks off of National 1 and heads south across the end of local route 6 in a very non-clock-face way. 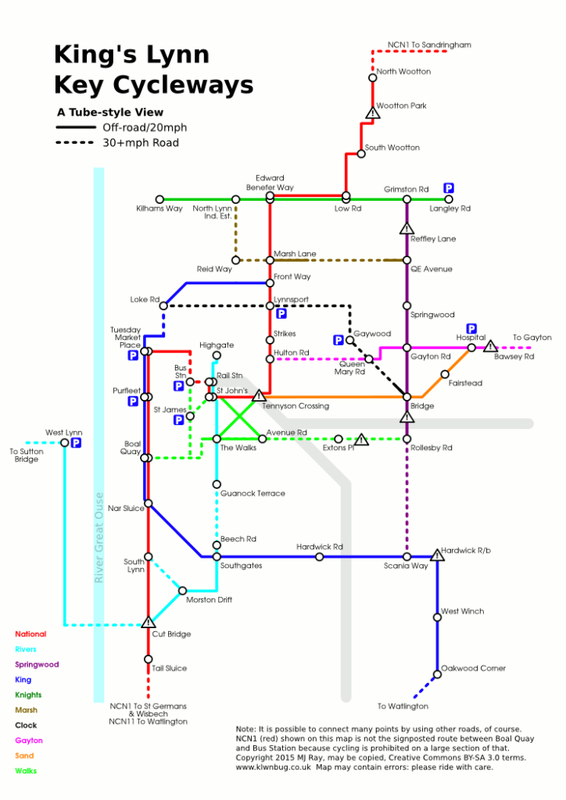 This is the previous 2015 tube-style map of the key cycle route network in King's Lynn. Click it for the full-size version.